Stone Soup for Five: Can a journal change your life? 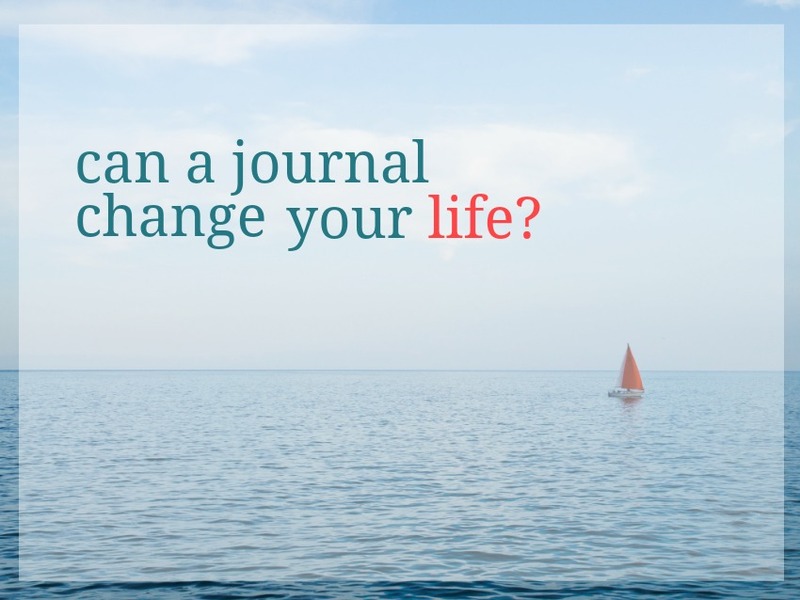 Can a journal change your life? 1. Scheduled Bible reading lists created a lot of stress in my life. I firmly believe that the last thing the Word of God should be is stressful. Volumes One and Two (and all the other books in the series) will ALWAYS be schedule free. If it takes you a week to finish a chapter or an hour, you will never be behind. While there definitely was value in reading through the Bible in a year to get an overview of how it fit together, I was still looking for a way to read, apply, and grow in the truths of Bible. 2. Sprinting through multiple chapters a day just left me parched. When I read just to read and mark off that day's reading, I walked away neither remembering what I read, nor feeling much different than I would if I had read multiple chapters in any other book. That was so frustrating to me! Multiple times while sprinting through the Bible I had the feeling like the Holy Spirit might be gearing up for a "I can't wait till she reads this part!" and I zipped right past it, because time was short, and I needed to remember to get ketchup, and prune the roses, and wondering what we were going to do about the needed car repairs. --sigh-- Rushing never created peace or rest or any refreshment from my time with God. 3. I needed to know more about God, and that is never quick nor easy. I love the Puritan quote, "God will never give assurance to lazy a Christian." That has stuck with me for years. In order to have any sort of assurance in our walk with Christ, we need to KNOW CHRIST. And what better way to know Him than by taking the time to meet with Him in His way and on His time. I just need to be faithful to meet Him there and pay attention. His Spirit will always take care of the rest. 4. I needed to learn how to apply God's word to my everyday life. For years as a young mom with rambunctious boys, I needed to know how to deal with all the issues that parenting threw at me (I thought it was my boys that were causing problems, but it was my own sin and selfishness) and because I had the wrong problem in my focus, I was looking for the wrong answers. Add on top of that the fact that I had NO IDEA where to go in the Bible to deal with any problem because I wasn't even sure it had the answer to this in-my-face-problem today. For years I turned to books ABOUT the Bible. I thought that if someone else did the digging and had thoughts about what they discovered it would help me, save time, and I'd have the answers I needed, my boys would behave and love each other, my husband would always be super thoughtful, and God would never ask more of me than I was comfortable with, if I could just find that magic answer! Believing this lie kept me in chains, depressed, discouraged, and frustrated with my very non-Instagram life. That would rear its head by me lashing out at the boys, my husband, and even myself. The truth is the growth I longed for, and the knowledge I needed, comes from the digging. And, surprisingly, now almost every single day God meets me right where I am. All I needed to do was slow down and take the time to meet Him. In the gospel of Matthew, He spoke directly into my life (sometimes painfully, sometimes joyfully). He taught me to seek and expect Him to show up, what repentance is, and to have GREAT EXPECTATIONS of Him rather than sin. He gave me rich insights into prayer, what a Cross-bearing life is, and He taught me so much about my own heart and my boys'. He met me right there to talk about true rest, true faith, and how to prepare well for suffering. And He did the same again in Genesis (Genesis! The Old Testament)! The best part is I needed to hear and learn all of this, but would have never guessed these were the answers. For so many years I thought I knew what my troubled heart needed and would look for that specific cure in other books. Who knew that the problems were actually completely different than I imagined, and the cure was right there in God's Word? And all I needed to do was take the time to listen. 5. I needed the guidance and tools to properly gain both wisdom and application from His word. After taking hermenutics and inductive Bible study classes, I had an answer, but now I needed the format. I tried loose leaf paper and binders, journals, composition notebooks... all of which worked, but left me with papers, journals, and scattered truths here and there. I had no place to organize them all and make it easy to review and remember. I needed a book--a journal--that had specific books of the Bible on the spine that I could easily see, pull out, refer to, and reflect on. There was nothing out there like that, so I had to make it! I can't even tell you how much meaning Volume One has to me, with pages full of notes, quotes, inserted papers, thoughts, and prayers. And hopefully, some day after I'm home with my Jesus, my boys or their children will be able to flip through them and see what I learned from God's word and learn how to do that for themselves. What a precious legacy of God's goodness and faithfulness it will be! I'd love to share this same thing with you. 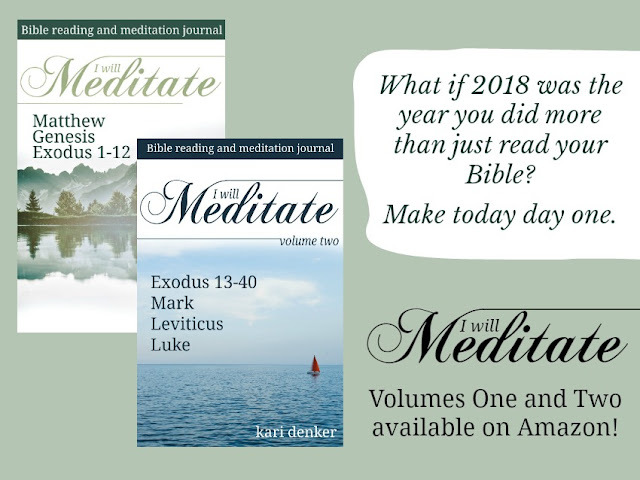 Hop over to Amazon and to grab I Will Meditate One or Two and see how God shows up in your own life! This week only (March 19-23) Volume Two will be at a special price too. If you've worked in Volume One, I'd love to here your thoughts below. I will also be doing a flip through of my journal and show you details of Volume Two on Facebook and Instagram! I just started volume one 5 days ago, and already, it is cultivating a hunger for the Lord within me. Thank you for putting it all together in an easy to use format. Oh that is so encouraging to hear! So thankful you are using and enjoying it! Just ordered both, Keri! Congratulations on your new release! So happy for you! God bless! Thank you! I pray they bless you!